As we look back, it has been a month since history was made as the Girls' Development Academy kicked off its inaugural season of action on October 2nd. 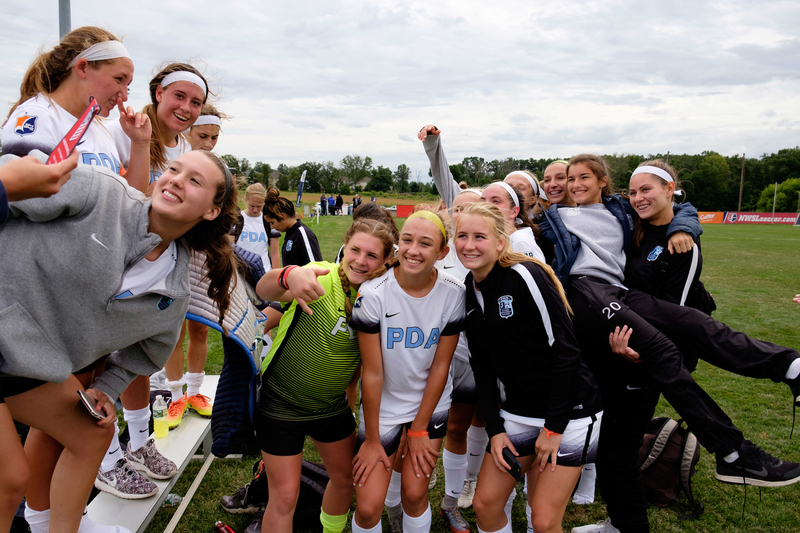 After 10 years of growth for the Boys' Academy, the feature game in Somerset, N.J. between Sky Blue - PDA (Somerset, N.J.) and FC Virginia (Chantilly, Va.) launched a season that will see over 6,000 female players take part in the nation's highest level of youth soccer. "The positive impact of the U.S. Soccer Girls' Development Academy has been immediate," said Miriam Hickey, Girls' Academy Director. "Teams are training more often in sessions that have been structured with a more deliberate long-term plan. Clubs have created a more consistent training environment… and this work is already translating in a more controlled attacking style of play in games, that will continue to improve the development of the players in the Academy." As a world leader in women's soccer, the launch of the Girls' Academy represents a significant investment in the growth of the sport and ensures the U.S. continues to win at the international level. To further these efforts, several current and former Women's National Team players, including several World Cup champions and Olympic gold medalists, have gotten involved with the Girls' Academy. Since the September kick-off, over 230 games have been scouted by the Academy's technical advisors and market scouts, with nearly 300 players identified for the Youth National Team pool. In the 2016-17 cycle, over 92 percent of Youth National Team players come from Academy clubs. The Girls' Academy's launch made a splash on social media, as the Academy generated nearly a million Twitter impressions, 20,000 Instagram likes and 70,000 Snapchat filter views during and leading up to opening weekend. The feature game also kicked off the Academy's Concussion Awareness Week, presented by Recognize to Recover and ThinkTaylor. As a part of Concussion Awareness Week, over 17,000 Academy players had the opportunity to take the #TTPledge, an oath to be educated on concussion symptoms, be honest in self-evaluation of head injuries and be supportive of those with a concussion. Former Men's National Team star Taylor Twellman, founder of ThinkTaylor, was on hand for the pregame ceremony. Twellman was excited to be a part of the historic launch of the Girls' Academy. "It's the elite of the elite at this level… I think it's extremely important this year with the girls coming in. They are equally if not more important to educate on the world of concussions because the numbers show that they're more susceptible to it." Twellman said. "For the U.S. Soccer Development Academy to partner and start the process means that everyone else will follow. I think that's a huge step… We'll remember today… we'll be talking about this for years to come." The inaugural match of the #GirlsDA has kicked off in New Jersey! After the pregame festivities, an all-female referee crew presented the game ball for a "monumental" day in girls' sports. While the launch of the Academy provides a new playing field for the best female youth players in the country, it also brings additional opportunities for exceptional referees at Academy games and showcase events. After all of the build-up, the game delivered, with a highly-competitive contest that provided a showcase for elite talent. Live streamed on the U.S. Soccer Development Academy Facebook page, the broadcast saw over 750,000 impressions. The teams traded blows in a tight first half before Natalia Ramirez finally broke through in the 67th minute. The FC Virginia goalkeeper came up to play Ramirez, but she juggled around her towards the net and knocked it in for the Girls' Academy's first-ever live-streamed goal. It was enough for Sky Blue - PDA to claim its first victory of the season, 1-0 over the visitors from Virginia. Sky Blue - PDA is one of two Academy clubs affiliated with the Sky Blue FC NWSL team. Nine of the league's 10 squads have ties to Academy clubs. In the lead-up to the game, the teams' coaches imparted the historic significance of the game and how much it meant to be a part of the Girls' Academy's launch. This fact was not lost on the sideline, as Academy parents basked with pride through the pregame pageantry and the high-level match that followed. Atlantic Technical Advisor Diane Drake was also impressed by the on-field product. "The opening fixture provided a meaningful competitive game, demonstrating exactly what the DA is about, impacting everyday club environments to develop world-class players," Drake said. "The formation and team tactical principles of both squads in all the games were easy to see come alive… The coaches, the players the scouts were all so engaged, it was beyond fantastic and it was very exciting for everyone." While the Girls' Academy launch kicked off its inaugural campaign, it was only the beginning. Several exciting Academy events are on the docket, starting next weekend in Orlando. Orlando Pride and NC Courage's academies will play on the morning of the NWSL Final on October 14 in the Girls' Academy's second feature game. The U-18/19 squads will kickoff at 11:00 am ET at Seminole Soccer Complex, with the game live streamed on the U.S. Soccer Development Academy Facebook page. After that, this December marks the first Girls' Academy showcase event- the Winter Showcase from Dec. 6 to 10 in Lakewood Ranch, Fla., featuring the U-15, U-16/17 and U-18/19 age groups. April brings the first exclusive Girls' Academy event- the Spring Showcase at BB&T Soccer Park in Greensboro, N.C. from April 6 to 10 for the U-14, U-15 and U-16/17 age groups. With all of the Academy action in the pipeline, there are plenty of avenues to get involved and engage in the country's highest level of girls' youth soccer. Become one of the Academy's nearly 35,000 Twitter followers or join nearly 31,000 who have liked us on Facebook.